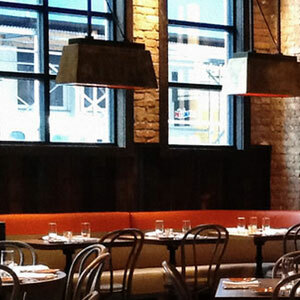 See Bobby Flay in the kitchen – without a TV camera in sight – at this NoHo newcomer offering bold Spanish-influenced Mediterranean dishes, an interesting, fairly priced wine list and spot-on service; busy and noisy, the casual, cavernous setting has an industrial feel, with wooden beams, exposed ductwork and an open kitchen. Bobby flay place. Went w/ Lauren after losing cowboy Seahawks bet. it was ok.
EDIT- tried to come here again on a Wednesday night after making a 9pm reservation on open table -- they had us waiting for 30 minutes and still we didn't get a table. We left not eating. Really not cool to have people waiting 30 minutes, ESPECIALLY your New Yorker crowd who might like to make gato a regular thing. Unsurprisingly, it's so hard to get a table here (relatively) because it's bobby flay and the UES, flatiron, and gramercy and older Hell's Kitchen crowd is rushing to this "HIP" "DOWNTOWN" restaurant to faux show off to their easily impressed friends how in they are. The food is definitely a notch above the standard "really solid" NY eatery, but it's not outstanding by any means. Also the crowd is not so hot. This makes it a weird place to choose because the food is only pretty good but it's impossible to get in short notice (and it's too crowded to eat at the bar). All in all good but not worth the hype. Spend your time planning a reservation at a restaurant more deserving of its hype. Great meal with terrific service at the bar on a Sunday night. Had roasted octopus and crab risotto. Could not have been better. At the bar next to me, the guy had the duck confit. He raved about it. Interesting and reasonable wines by the glass. Overall great experience, both food and service. Gato is celebrity chef, Bobby Flay's new NoHo restaurant, but Bobby must be MIA (missing in action) from this restaurant. The service, food and general management of Gato is abysmal! We saw our waiter twice the entire evening: when he took our order and when he gave us our check. Our appetizers and entrées came out cold. We actually had to flag down someone and send our entrées back, as there were inedible. The wait between our appetizers and entrées was so long, I actually considered cancelling the orders and going elsewhere. To add insult to injury, this woman, who seemed to be just circulating around the restaurant, came to our table and to the table next to us to offer a fake smile and an insincere apology (not quite sure what her job was other than to go from table to table apologize for all of the restaurant’s problems). While I do not expect a restaurant to compensate me for their poor service and improperly prepared food (obviously, I would prefer to have a nice evening with good food and good service), the gesture would have mollified the situation. This did not happen. Everyone: our waiter, the manager and the “apology woman” seemed to be oblivious, while they just walked around and talked to each other all evening. The unfortunate but significant irony of this situation is that the table next to us had the exact same experience. We were all in agreement that this restaurant isn’t worth it and doesn’t live up to its hype. There are so many other, better restaurants in NYC. Don’t waste your money. Don’t let the concept of “celebrity chef” sway you. At Gato it is meaningless. Too bad Bobby Flay and Laurence Kretchmer could not repeat what they had created at their other (now closed) restaurant, Bolo. I've never been to a Bobby Flay restaurant before, so I didn't go in expecting anything in particular but a solid dinner (given the modest but not excessive price tag and the hype). However, I have to say that overall I am disappointed and don't think I would return to this restaurant. The main issue I had with most of the dishes is the excessive use of salt and the heavy-handed preparations that left masked the majority of the intended flavor sensations. Most of the dishes we had emphasized salty, piquant and smoky flavors which completely overwhelmed the dishes. We started with 3 items from the bar menu - the burrata, the eleven layer potato, and the eggplant. I'll start with saying is that these items were the only enjoyable dishes we ate that night. The burrata was...interesting. I love burrata, the creamy richness of it is just hard to beat. The beets were a great touch adding some earthy and sweet notes. I think though the black olive oil, which was similar to an oily tapenade was too overwhelming to add to this dish. I can get where he was going with this, but basically once you got some black olive oil on your fork that just overwhelmed all the other flavors. I would've done a smoked honey instead for example...something to draw a little more sweetness out while contributing earthy smokiness. The eleven layer potato was awesome. A perfect bite of rich creamy potato and the sweetness of caramelized shallots and the accent of sage. Now this isn't complicated to make at all, and it makes me wonder why I just don't make a tray of this at home to snack on. The eggplant was a knockout too. Great flavor, good balance, really pleasing on the palate and delicate sweetness from the balsamic. Another simple dish really, but just so good. Now onto the main dishes. My wife had the tarragon chicken. The chicken itself was juicy and had good flavor. The skin was crisped nicely, but wow, way too salty. So salty that I couldn't get any of the licorice notes from the tarragon. And the potatoes and dandelion greens were completely overwhelmed by salt and blue cheese. Literally, all I could taste was blue cheese and salt, which is impressive given dandelion greens *should* have a bold green flavor to them. I had the rabbit. The rabbit was cooked well, juicy and tasty. I really loved the fregola sarda and peas. The peas had a wonderful firm, bright sweetness to them. The carrot hot sauce however was ruining the dish. There was absolutely no sweetness from the carrot. All I could taste was a muddy, smoky, salty condiment that when eaten with the rabbit just reduced the flavor to a muddled taste. If I could redo dinner, i would forgo this sauce completely and just drizzle their tasty olive oil over the dish, and maybe a simple squeeze of lemon. To go with our dishes we had the crispy potatoes with poached egg, paprika and parmesan. I was so excited when I ordered this, I pictured potatas bravas jacked up with an egg and parmesan. I can't describe how disappointing it was in comparison to what I expected. The preparation again was heavy handed with salt and way too much smoky paprika. This dish needed some tomato and/or vinegar to cut the smoky, earthy flavors from the paprika (which there was too much of). We didn't bother with dessert after this, and decided to try our luck elsewhere - like getting cookies from Jacques Torres. If I were ever to come here again, I would stick with the bar menu and order some of the simpler, but flavor packed, small plates.